MORE than 100 kilograms of Marks & Spencer's berries cherries flakes imported by its Shanghai subsidiary failed quality tests and were destroyed, China's top quality watchdog said yesterday. The batch of berries cherries flakes, weighing 135 kilograms, failed the inspection for excessive water content, the General Administration of Quality Supervision, Inspection and Quarantine announced on its website. The flakes were made in the United Kingdom. The product is available at the Nanjing Road W. store of the British retailer. A box of 375-gram flakes is priced at 59 yuan (US$9.5) at the Shanghai store. 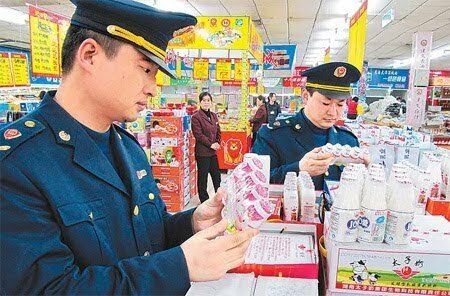 The flakes are among 157 imported food and cosmetic items found to be substandard in May. They included cheese, chocolate, biscuits, formula powder, wine and vegetable oil. They were found to have expired, contain excessive amounts of coliform bacteria or sulfur dioxide, register high acid levels or have broken packages. Cheese produced by French producers of Reverend, Le Roitelet and Bressor were on the list for excessive coliform bacteria, while cheese made by Italian Centro Latte Stasi SRL expired. Graham crackers produced by New Zealand's Griffin's used brown HT, a food dye banned in China. It may provoke allergic reactions in asthmatics and induce skin sensitivity. An Indian tea produced by Pekoe Tips Tea was found to contain dicofol, a "slightly hazardous" pesticide classified by the World Health Organization. Olive oil produced by Spain-based Euroaliment PAC SLU contained excessive benzo(a)pyrene, which can cause cancer if consumed in large amounts. Milk chocolate eggs produced by Thorntons PLC and Craft Foods Inc were found to have problems with their tags. Some wine from Japan and Italy were being listed for containing excessive manganese and cadmium.